Elvis Presley is one of the most famous figures of our time, so of course theres been numerous attempts at making a successful biopic about him. While there have been several films featuring Elvis and even some that have made an attempt at capturing parts of his life, there has yet to be a definitive biopic on him that is considered must-see entertainment. April 25, 1912 Gladys Love Smith April 10, 1916 Vernon Elvis Presley June 1933 Gladys Smith and Vernon Presley are married. January 8, 1935 Tupelo, Mississippi Gladys Presley gives birth to twin sons, Jessie Garon & Elvis Aaron. Sadly, Jessie is stillborn. 1935-1948 Elvis grows up within a close-knit, working class family in Tupelo, Miss. Elvis attends the Assembly of God Church with his family where the music register deeply within him. Other influences upon Elvis include black bluesmen in the neighborhood and country music radio programs enjoyed by his family. 1946 – Elvis’ parents cannot afford a bicycle that Elvis wants, so Gladys talks him into accepting a guitar instead. 1948 – Elvis and his parents pack their belongings in a trunk strapped to the roof of their 1939 Plymouth and move to Memphis , Tennessee in search of a better life. 1953 – Elvis works at Parker Machinists Shop after graduation. That summer he visits The Memphis Recording Service, home of the Sun Recordings, where he makes a demo of “My Happiness” and “That’s When Your Heartaches Begin” for a cost of about $4.00. 1954 – Elvis teams up with local musicians Scotty Moore (guitar) and Bill Black (bass) to create a sped-up version of Arthur “Big Boy” Crudup’s “That’s All Right.” This song becomes the first of five singles Elvis will release on the Sun label. The group starts to tour small clubs throughout the South, enjoying moderate success with the record sales. Elvis’ one appearance on the Grand Ole Opry doesn’t go over particularly well and one of the Opry officials reportedly suggested that Elvis go back to driving a truck. October 1954 Elvis and his band appear for the first time on the Louisiana Hayride, the Grand Ole Opry’s chief competitor. Elvis signs a one-year contract for 52 Saturday night appearances. During Elvis’ association with the Hayride he meets “Colonel” Tom Parker. 1955 – Colonel Parker becomes Elvis’ exclusive manager. November 20, 1955 Elvis signs his first contract with RCA Records for an unprecedented $40,000 with a $5,000 bonus. 1956 – Elvis has his first session with RCA, where he records “Heartbreak Hotel.” January 27, 1956 “Heartbreak Hotel” released by RCA sells 300,000 copies in its first 3 weeks and earns Elvis his first gold record. January 28, 1956 Elvis’ first network television appearance occurs on “Stage Show,” starring Tommy and Jimmy Dorsey on CBS. March 13, 1956 RCA releases Elvis Presley, Elvis’ first album. April 1, 1956 Elvis does a screen test for Paramount Studios which leads to a seven-year film contract. June 5, 1956 Elvis appears on Milton Berle Show where his racy moves are condemned by the “morally concerned” The kids love it! July 1, 1956 Elvis appears on “The Steve Allen Show” on NBC. September 9, 1956 Elvis makes the first of three appearances on “The Ed Sullivan Show” where he attracts the highest ratings ever for any television variety show. March 1957 Elvis buys Graceland for himself, his parents and his paternal grandmother. October 17, 1957 “Jailhouse Rock,” Elvis’ third motion picture, premieres in Memphis and later opens nationally in November. November 10-11, 1957 Elvis performs in Hawaii for the first time. December 1957 Elvis and family enjoy their first Christmas at Graceland where Elvis officially receives his draft notice. March 24, 1958 Elvis is inducted into the US Army and assigned serial number 53310761. November 1959 Elvis meets Priscilla Ann Beaulieu at a party. January 20, 1960 Elvis is promoted to Sergeant. October 1960 The soundtrack album for “GI Blues” becomes Elvis’ most successful album of his career on the Billboard charts. August 27, 1965 The Beatles visit with Elvis for several hours at his home in California and have an informal jam session. December 1966 Elvis formally proposes marriage to Priscilla. February-April 1967 Elvis films “Clambake,” his 25th movie. February 1, 1968 Priscilla gives birth to Lisa Marie Presley nine months to the day after her marriage to Elvis. October-December 1968 Elvis starts filming for his 30th movie, “The Trouble with Girls” December 3, 1968 “Elvis” premieres on NBC. January 15, 1971, Elvis is voted one of the Ten Outstanding Young Men of America by the United States Junior Chamber of Commerce: better known as the Jaycees. December 1970 Elvis’ makes his famous visit to President Richard Nixon at the White House. Late 1971-Early 1972 Elvis and Priscilla separate. Priscilla takes their daughter, Lisa Marie, with her. July 1972 Elvis and Priscilla’s separation is formalized pending divorce. Elvis dates Linda Thompson, who will be with him 1976. October 1972 Elvis has a #2 hit with the single “Burning Love,” one of his biggest records in recent years. March 1973 The Colonel and Elvis sell off his entire recording catalogue to RCA. April 4, 1973 Elvis makes entertainment history with his “Elvis: Aloha from Hawaii Satellite” special. Elvis is in top form physically and vocally in, arguably, his greatest career moment. November 1, 1973 Elvis is hospitalized in Memphis for recurring pneumonia, pleurisy, an enlarged colon and hepatitis. Additionally, Elvis battles an increasing dependency upon prescription drugs. January 29 – February 14, 1975 Elvis is again hospitalized with prescription drug issues. Early November 1976 Elvis and Linda Thompson, his steady girlfriend since 1972, split. Late November 1976 Elvis meets Ginger Alden who will be his steady girlfriend until his death. June 17-26, 1977 Elvis tours June 19, 20 and 21 are recorded by RCA for an upcoming live album and upcoming CBS Television Network special. The camera gives a shocking picture of Elvis’ poor health in his final days, but his voice remains strong. June 26, 1977 Elvis performs his last concert at Indianapolis Market Square Arena. August 1, 1977 – Three former bodyguards publish Elvis: What Happened? which details Elvis’ drug use for the first time in public. August 14, 1977 – With just three days left before he was to begin another tour, Elvis begins another crash diet, eating large quantities of fruit and drinking plenty of water. August 15, 1977 – Elvis is seen in public for the last time when he and Ginger Alden cruise through Memphis on his Harley. August 16, 1977 – Returning to Graceland and unable to sleep, Elvis takes another dose of medication and tries to read. He finally takes a copy of The Face Of Jesus into his dressing room / bathroom. Ginger tells him not to fall asleep and he replies “OK, I won’t.” Shortly after 2 PM Ginger awakes and when she realizes that Elvis is not in bed, she knocks on the bathroom door. When he doesn’t answer, she looks in to see Elvis curled up in a fetal position on the floor near the toilet. Ginger calls downstairs and Joe Esposito and Al Strada come running. They find Elvis with no color and no apparent signs of breathing. The fire department is called and ambulances rush to the scene. Elvis is taken to Baptist Hospital where he is pronounced dead at 3:30 PM. August 16, 1977 – Upon hearing of Elvis’ death, Colonel Tom Parker makes two phone calls. 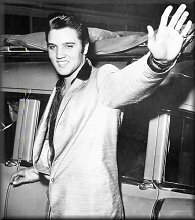 The first was to Vernon Presley, the second to an Elvis merchandiser, Factors Inc.
August 16, 1977 Shortly after midnight Elvis returns to Graceland from a visit to the dentist. During the early morning of the 16th, he takes care of last minute tour details in preparation for a concert in Portland, Maine the next day. He retires to his master suite at Graceland around 7:00 AM goes to the bathroom to read. At 2pm Elvis is found dead by Ginger Alden. August 17, 1977 – Elvis’ body is returned to Graceland where he will lie in state for one day. 75,000 people are waiting to pay their respects, but by the time the gates are closed again at 6:30, only 20,000 had viewed the body. As a soft rain began to fall, the rest of the crowd left quietly. August 18, 1977 – Elvis’ funeral is held in Memphis. The pallbearers are Lamar Fike, Charlie Hodge, Gene Smith, George Klein, Joe Esposito, Billy Smith, Jerry Schilling and the man that some say over-prescribed Elvis’ medication, Dr. George Nichopoulos. Col Tom Parker turned down the honor. The King is buried at Forest Hill Cemetery. October 2, 1977 – To control the crowds of mourners, the bodies of Elvis and his mother are moved to Graceland. June 26, 1979 – Vernon Presley passes away. New executors of Elvis’s estate are named by the court. They are Priscilla, Elvis’ accountant Joe Hanks and the Memphis National Bank of Commerce, acting for Lisa Marie. August 14, 1981 – Judge Joseph Evans orders that Elvis’ estate does not have to make any more payments to Col. Tom Parker, ending his 36 year hold on much of the king’s finances. May 29, 1989 – Lisa Marie and her husband Danny Keough, whom she married on October 3rd, 1988, announce the birth of Elvis’ first grandchild, a girl named Danielle Riley Keough. October 21, 1992 – Elvis’ grandson, Benjamin Storm Keough is born to Lisa Marie and Danny. May 6, 1994 – Lisa Marie and Danny Keough are divorced. May 26, 1994 – Lisa Marie marries Michael Jackson. July 1995 – Elvis’ physician, Dr. George Nichopoulous, loses his medical license for being “too liberal” in prescribing addictive drugs. January 29, 1996 – Lisa Marie files for divorce from Michael Jackson. January 21, 1997 – Col. Tom Parker passes away at the age of 87. 2002 – Graceland takes in $15 million in annual admissions alone, with sales of Elvis’ records and souvenirs topping $37 million. June 16, 2002 – Elvis back at No. 1 on the UK singles chart for the first time since “Way Down” hit the top shortly after his death, with a remix of his 1968 track “A Little Less Conversation”. It’s Presley’s 18th UK No. 1, moving him ahead of the Beatles, who have 17. August 10th, 2002 – After proposing just ten days earlier, actor Nicolas Cage marries Lisa Marie in an outdoor wedding at the Mauna Lai Bay Hotel on the Big Island of Hawaii. After 108 days of marriage, he files for divorce. December 17 2004 – Elvis Presley’s daughter Lisa Marie Presley agreed to sell 85% of his estate to businessman Robert FX Sillerman in a deal worth $100 million. Sillerman will run Presley’s home Graceland, and own Elvis’ name and likeness, the rights to his photographs and revenue from his music and films. Lisa Marie will retain possession of Graceland and many of her father’s “personal effects”. January 9, 2005 – “Jailhouse Rock” entered the UK singles chart at #1, the day after the King would have turned 70 years old. The song became the 999th #1 in the history of the British chart, having also been the 67th in January 1958, when it was the first disc to enter the survey at #1. January 22, 2006 – Lisa Marie is married for the fourth time to music producer Michael Lockwood. Michael’s best man was Lisa Marie’s first husband, Danny Keough. October 7, 2008 – Lisa Marie and Michael became the proud parents of twin daughters named Finley and Harper. October 28, 2008 – Forbes ranks Elvis as the top-earning dead celebrity for the second year in a row. Presley pulled in $52 million in the past year, helped by increased visitors to his Graceland estate to commemorate the 30th anniversary of his death.